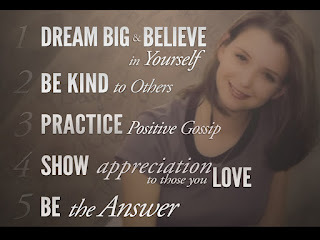 If you haven't heard of Rachel's Challenge, I encourage you to visit this website, http://www.rachelschallenge.org/. I went to a presentation tonight at my son's school and it was so moving. I am so glad I went. Today was on plan, although I have been slacking with my supplements. My classroom assistant bought me a new water cup, so that really brightened my morning! I had to "find" 30 minutes after school to work out. It's been a BUSY afternoon... I am patiently waiting for my kids to hurry and go to bed because I am TIRED. I have two meetings after school tomorrow, then church. I am thinking about dropping my kids at church and then going to work out... I know. I'm a heathen. I hope everyone reading had a great day! Tomorrow will be the end of my 2nd week completely on plan. I'm almost 1/2 through my challenge and I am feeling very focused, still. My weight loss has slowed this week, but I had a huge loss last week, and I am still in TOM. Thing is, I KNOW that I am doing everything that I am supposed to, so I am not discouraged. The scale will always catch up. I am so close to getting out of the 300's for good I can taste it! I can't wait! Great job....you are doing wonderfully. I'm right there with you on the scale issue. I'm trying to be patient and keep telling myself...the scale WILL catch up. So proud of you Hollie! I love following your progress!! New follower here...sounds like a great day and looks like you are doing a great job all around.